There are a number of causes of muscle pain in the upper thigh. First, IlioTibial Band: Pain down the outside thigh is often caused by a very tight iliotibial band(ITB)which can be very painful and is also difficult to stretch effectively. The muscle is made up of a wide flat tendon, rather than muscle fibres, and runs down the side of your legs from the hip to below the knee. When tight, it aches, and can cause problems in both the hip, knee, lower back as well as the length of the outside upper leg. 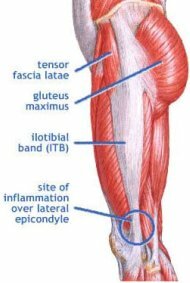 This is what is known as iliotibial band syndrome. The syndrome is a common result and injury zone for sportspeople. There are many stretches available, such as the simple standing stretch below. To start, cross your right leg over left. Most of your weight should be on your left leg. With arm overhead, lean as far as you can to your left - away from the leg suffering from iliotibial band syndrome. If you move hips forward, you’ll feel the stretch on outside of the right leg and maybe lower back. This stretch is divine! First, find a balanced position. You may find at first if the arm I have over my head is actually helping you balance more if you place your top hand on the floor in front of you. Secondly, make sure that the top leg is not sitting on top of the other. You need to totally relax and let that leg drop. If you really want relief from your pain in upper thigh however, this is the way to go. You'll have to find yourself a good high-density foam roller first. This is simply the BEST stretch. It hurts like mad (sorry about that), but really does work - and quickly. I have an ongoing problem with my ITB, so the roller is left in front of the television set – it’s the only way I can’t avoid it, because if I don’t maintain the stretches, I pay for it big time. So, choose your favourite program, and go for it! Lie sideways with left leg on roller. Place right leg on floor in front. With all weight on left leg gently roll, slowly, in both directions from the knee and up to the hip....ouch! Your quad muscles at the front of your thigh, are called hip flexors. These may also be tight , click on this link to take you to further stretches that will help. CLICK HERE. Your hamstrings may also be giving you a bad time. These hamstrings stretches will certainly help also. CLICK HERE. In the right hand column, you have access to our online Correct Posture Test which will help you to discover exactly what stretches will be of benefit to you. This is available when you receive for our monthly newsletter.